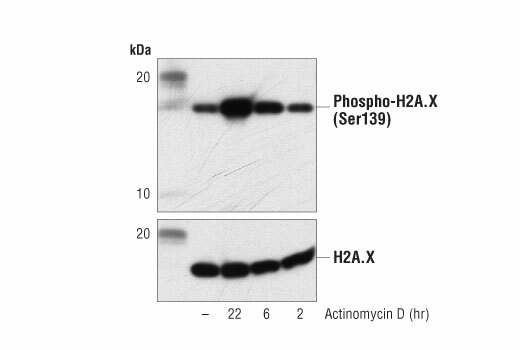 Western blot analysis of extracts from MCF7 cells, untreated (-) or treated with Actinomycin D (1 μM) for the indicated times, using Phospho-Histone H2A.X (Ser139) (20E3) Rabbit mAb #9718 (upper) and Histone H2A.X (D17A3) XP® Rabbit mAb #7631 (lower). Western blot analysis of extracts from MCF7 cells, untreated (-) or treated with Actinomycin D (1 μM) for the indicated times, using Phospho-p53 (Ser15) Antibody #9284 (upper), p53 (7F5) Rabbit mAb #2527 (middle), and β-Actin (D6A8) Rabbit mAb #8457 (lower). Chemical structure of Actinomycin D.
Actinoymcin D is supplied as a lyophilized powder. For a 10 mM stock, reconstitute the 5 mg in 398.28 μl DMSO. Working concentrations and length of treatment can vary depending on the desired effect, but it is typically used at 10-1,000 nM for 6-48 hr. Store lyophilized or in solution at -20ºC, desiccated. Protect from light. In lyophilized form, the chemical is stable for 24 months. Once in solution, use within 1 week to prevent loss of potency. Aliquot to avoid multiple freeze/thaw cycles. Actinomycin D is an effective anti-tumor agent and the most widely studied member of the actinomycin group of antibiotics (1). The compound, isolated from soil bacteria of the Streptomyces genus, is comprised of two cyclic pentapeptides bound by a phenoxazone group (2,3). Actinomycin D inhibits mRNA transcription in mammalian cells. 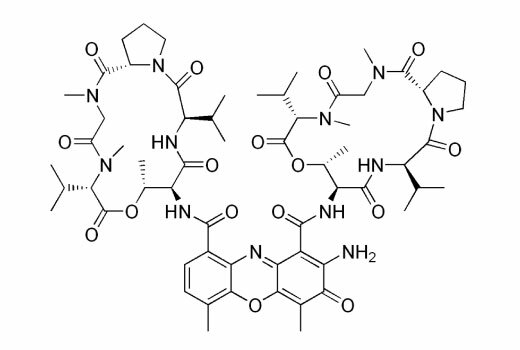 Actinomycin D intercalates DNA and stabilizes topoisomerase I-DNA covalent complexes, blocking RNA chain elongation by RNA polymerase and consequently inhibiting protein synthesis (1,4,5). This mechanism of action induces p53-mediated cell cycle arrest in numerous cancer cell lines (6,7) and at high concentrations can induce apoptosis (8). 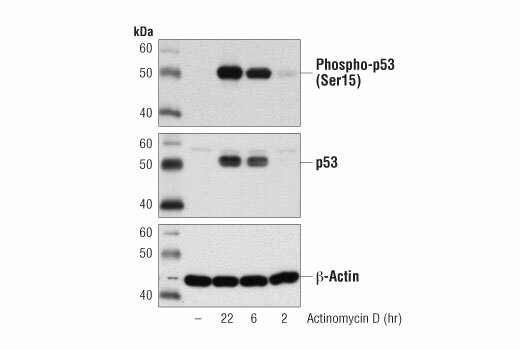 Additional research studies show that Akt mediates actinomycin D-induced p53 expression (9). Koba, M. and Konopa, J. (2005) Postepy Hig Med Dosw (Online) 59, 290-8. Bensaude, O. (2011) Transcription 2, 103-108. Lo, Y.S. et al. (2013) Nucleic Acids Res 41, 4284-94. Sobell, H.M. (1985) Proc Natl Acad Sci U S A 82, 5328-31. Trask, D.K. and Muller, M.T. (1988) Proc Natl Acad Sci U S A 85, 1417-21. Chang, D. et al. (1999) Cell Growth Differ 10, 155-62. Khan, Q.A. and Dipple, A. (2000) Carcinogenesis 21, 1611-8. Fraschini, A. et al. (2005) Histol Histopathol 20, 107-17. Chen, C.S. et al. (2014) Oncotarget 5, 693-703.